"I was one of the lucky people selected to test the RL50 powder earlier this year. I was not very enthused that someone could produce a powder that would shoot better in the .50 BMG than the VhitiVouri 20N29. Boy, was I wrong! The first time I tested it I was impressed. I shot it in the May regional match at Raton, New Mexico. Even though we had very bad winds, I won 1st in light gun group and 1st in light gun score while shooting the smallest aggregate of the match, which was 10", not very small, but in those winds I can't complain. That was good enough for me to use it again in July at the World Championship match, also at the NRA Whittington Center in Raton. Once again I won both light gun group and score, and even with the tricky winds we had in July, I shot the smallest aggregate of the match, an 8.2". As the Technical Editor of the FCSA's Very High Power magazine I intend to write my next article on RL50 powder to alert the rest of the membership to the quality of your new product." "...I was able to buy one pound of Reloder 17 and started below maximum suggested loads and work up toward max. At 0.5 grains below max I have loads below 1 MOA from the bench from my .270 Win...Elk beware." 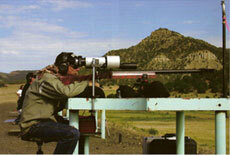 "I had a very hard time trying to find a load that my 7mm liked. I tried about ten different powders with 4 different types of bullets and countless charge weights and bullet lengths. I tried the Barnes TSX and followed their recipe exactly. Now with the help of 61 grains of Alliant Powder RL 25, I am now shooting a .5 inch group at a hundred yards. I am very satisfied with how Alliant Powder performs in this load and I don't think I will ever change to anything else." Please fill in the form below with your information and submit.